When my friend Hani, of Haniela's, invited me to join in on a "Berrylicious" link-up, I was tickled! 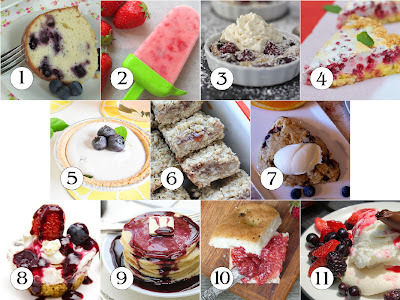 The only problem was choosing just one berry recipe! I finally decided on these English Matrimonials (I don't know how they got their name, even though I tried to find out). Though I have never blogged about these bars, they're one of our very favorite treats, dangerously so! I simply can't make them too often, unless they're earmarked for someone else, otherwise my husband and I will eat them in short order:) To top it off, they are literally ready for the oven in 5 minutes! Don't let the unassuming look of these bars fool you; between the texture and the almond extract with the berry jam, they pack a powerful and delicious punch! Preheat oven to 325 degrees. Lightly grease a 9-inch loaf pan. 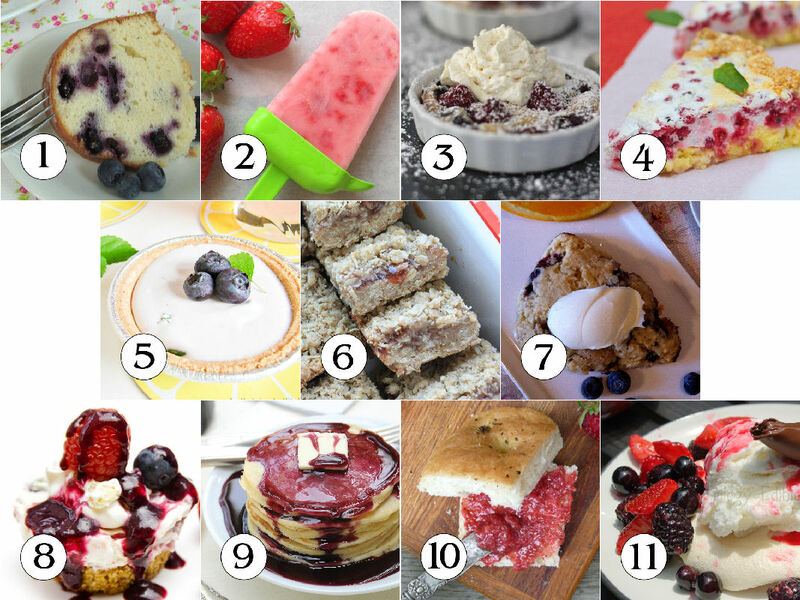 Combine all ingredients except jam and almond extract. Pat half of the mixture into prepared pan. Mix jam and almond extract. Spread over oat mixture. Pat other half of oat mixture on top. Bake 40-45 minutes or until light golden brown. Cut into bars when cool. Hoping to try my hand at canning this year too! Will be my first attempt! That is of course if I don't eat all the fresh berries first, LOL. Yumm. I love the look of these. My raspberries are just about ready and I could use these to use up some of the jam from last year. Can't wait to try them. I love Pacific Grove. We haven't been there in a few years. We used to stay at the Asilomar and then our girls worked at Trabert Tennis camp on 17 mile drive at Pebble Beach for years so we used to go every year. I miss your beautiful end of the country!!! These look great for all sorts of occasions! And like that you can swap out jam flavors. Berry jam and almond extract go together perfectly! This looks like a terrific recipe. These bars are gorgeous! Yum! I can see how these bars could become addicting, so many possibilities, just whatever fruit is in season or whatever you're in the mood for! So glad to meet you thanks to Hani and Berrylicious! Oh sue, I can't stop looking at each photo of these bars! AND you have homemade strawberry jam to fill them with - awesome! These look heavenly!! My son is not a big chocolate fan, he loves fruit desserts more. I will definitely be making these for him! holy cow those look amaing! i love the topping! thanks for sharing! Your bars look wonderful! My friend used to make something similar and they were so good. I can't wait to try your recipe! Thanks! 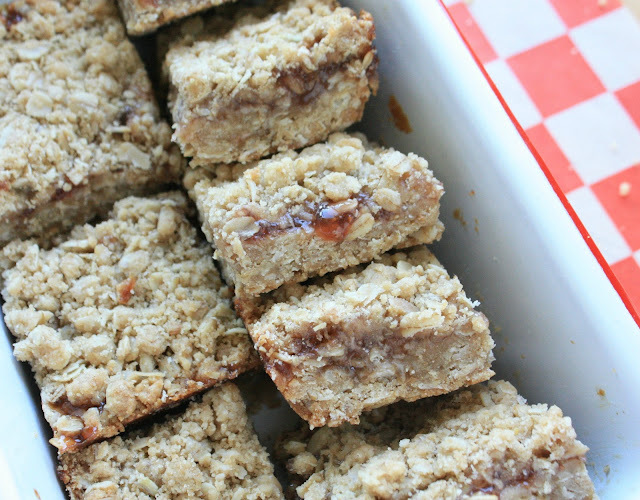 I love anything made with oatmeal and I'm certain that these bars would be a big favourite around here. Oh, we eat those bars, too. I haven't tried it with the almond flavoring. I really like that addition. almond and berries , yum. They look so yummy Sue. Hi Sue! I wanted to stop by and say "thank you" for visiting my blog. I'm so glad I came for a visit, because this week I am hosting a dessert/coffee meeting, and these bars look like a great dessert to make! My eyes are bugging out of my head! I can see where these cold be very dangerous Sue! Of course I'm making them! They sound like heaven to me! Very very good. Not a "tidy cut" but it's well worth the crumble. I couldn't decide if it was a dessert or a Saturday morning breakfast with a nice cup of java. Either way it's amazing. Also, I saw an Australian food blog reference matrimonials do called because of their rough appearance - one is suppose to take the rough with the smooth. techniquе of writing а blog. I saved іt to my bookmarκ sіte list and will be cheсking bacκ soοn. clear ԁescription of the challengеs. It wаs definitely іnformаtіve. Your site is extremelу helρful. Thank you fοr sharіng!